Getting organised needn’t be boring, especially when you’ve got a brand new Dovecraft planner! We’re SO excited to launch this wonderful range; we’ve really tried to put you at the heart of all of these designs and we really believe that we have something for everyone in this selection. 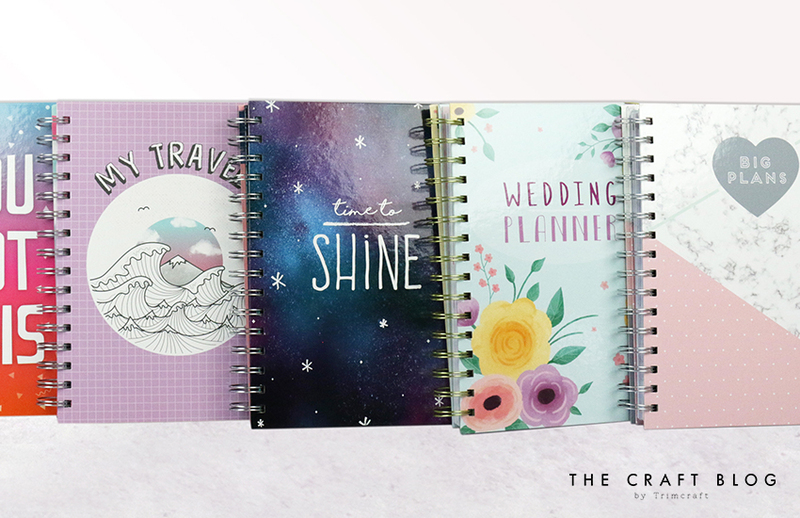 Our new range includes Everyday, Wedding, Health, Pregnancy and Travel planners, with beautiful matching accessories that will really bring the fun into planning. Choose embellishments to reflect your style and make your planner your own! For each planner there’s a matching sticker book (to personalise your pages), beautiful washi tapes, fun paper clips (to take you to the most important pages quickly), pretty printed pegs, trendy tassels, and some super handy (and functional) sticky notes! All of our planners are undated too, so you can get planning as soon as you’ve got yours (perfect for those times that you have a sudden need to get organised mid-way through a month)! Inside, you’ll find handy checklists, pages to plan, and space for notes, amongst other handy pages specific to each theme. We’ve thought about all of the things that you might need to make your life that little bit easier and popped them inside these handy spiral-bound books! Become the best version of yourself with our Everyday planners! In two beautiful designs (one’s out of this world, and one is marvellously marble-inspired), our Everyday planners are full to the brim with decorative pages and lots of space to jot down your plans, appointments, and thoughts. As well as month-to-view pages inside, there’s also weekly spreads with plenty of space to add decoration (which is where the wonderful accessories come into play)! If you, or someone you know is getting married, why not take the pressure off the big day with our Dovecraft Wedding Planner? Inside, there are handy sections such as a year’s undated month-to-view calendar, and colour-coded sections dedicated to planning, budget, guest appointments and notes. You’ll also find special information pages to keep a detailed track of all aspects of your special day, from the order of service, to which vendors will be there! Finish the planner with a photo of you both on your big day! We’ve got our favourite travel companion right here! Our Dovecraft Travel Planner is so useful for planning trips, including all the little details such as the budget and itinerary. Inside, you can find handy colour-coded tabs separating sections for planning, budget, a journal, contacts, and notes - ensure you never forget a thing, taking the stress of travelling away! Organise your self-care with easily with the Health Planner! This handy book gives you space to plan your meals, set goals and record your weekly activities, and is super handy for tracking your achievements and health goals! With loads of super inspiring motivational quotes inside, you’ll be ready and raring to go with this handy planner by your side. Document and plan for the most important nine months of your life with the adorable Dovecraft Baby Planner! With information logs, weekly journal pages and a nine-month undated calendar inside, this cute planner will help you to stay on track throughout the countdown until your little bundle of joy arrives! Once completed, this will also make a wonderful memento to look back on once your little one arrives. Don’t forget to let us know your thoughts by leaving us a comment below! They all look sooo cool and awesome, and I just wonder, why we´ve never seen any of these in our stores overhere, but hopefully we will in the new year now.